Nothing like a commitment or deadline to get ideas out of your head and into the kiln! For a while, I’ve had in mind a new body of work that combines human and animal figurative sculpture. So, way back in May, I signed up to create a Masterwork for the Carolina Designer Craftsmen show. It’s held every year in Raleigh, NC, over Thanksgiving weekend. This is the guild’s 40th anniversary. Several ideas ran through my head, but I felt most passionate about creating a series of pieces on people and their companion animals. Here is a brief overview of how the Masterwork piece came to be. 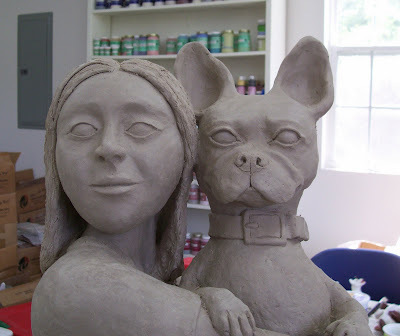 People often bring their dogs to outdoor art shows and, in recent years, I noticed a lot of pugs, French bulldogs and Boston terriers. I hadn’t seen a Boston terrier since childhood, a long time ago! So I became interested in why these breeds are enjoying a resurgence. Consensus is they are great family dogs, and do well with couples who live in apartments and can’t let dogs run loose. The piece, entitled, “Bodyguard,” is inspired by a photo I found searching the Internet (I think I keyed in “people holding dogs”). 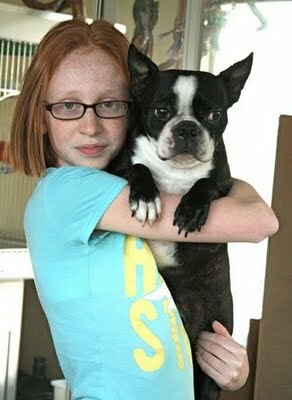 Up came an image of a girl holding a Boston terrier. It made me gasp aloud, “That’s it!” OK, being somewhat compulsive, I continued my search, but this photo was clearly the keystone for the series. The photo was taken several years ago. The girl, Phoebe Thompson, is the daughter of Julie Zickefoose and Bill Thompson III. The dog (or is he a person in a dog suit?) is Chet Baker, named after a famous jazz musician. To me, Phoebe has a mysterious Mona Lisa smile, with a touch of attitude, and Chet has a “Just try and mess with my person” look. Of course, I’m not sure what Phoebe and Chet were actually thinking, but my initial interpretation was that these two would fiercely protect each other. That has been most helpful. However, it was obvious I needed a live model. I didn’t know anyone who had a similar look, but our friend Sheri did…. 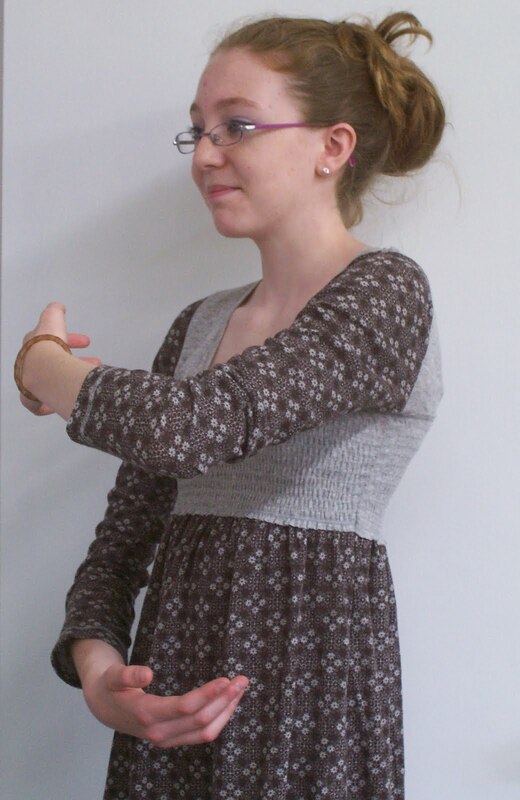 Savannah came to the studio and was very patient as I took some photos and measurements–if you stand like Phoebe, what do you look like from the side and back; how long are arms relative to hands, relative to face, etc. Since our dogs are either too big or too wiggly, Savannah held a beach towel part of the time. I incorporated a lot of realism, but also took some artistic license (see post on Harried Possum). And, although my initial vision was a red-haired, blue-eyed girl that may change, too. Hope you don’t mind, Phoebe and Savannah! As I write this, the piece is drying slowly in my studio. 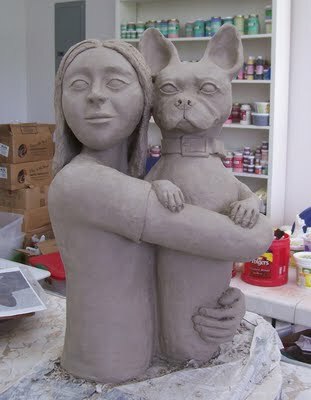 Please send good karma that it gets through its firings safely (and that I can get it into the kiln! It’s heavy!). Currently, I’m working on two other pieces (a middle aged woman cuddling a small dog and an elderly man with an old dog) for this body of work. More on those later.